I never thought I could love an audio recording of Lewis Carroll’s Alice in Wonderland (technically Alice’s Adventures in Wonderland and its sequel, Through the Looking-Glass) more than I love the unabridged version narrated by Christopher Plummer. His wonderfully hammy characterizations and its six hour running time made it the perfect soundtrack for picking nits from the foot long tresses of a first-grader who’d been sent home with lice. By the time she got the all clear, both of us had large portions of it committed to memory. Christopher, I treasure the memories of those long hours spent together on cassette, but I’m afraid I’ll be spending the 150th anniversary of Alice with Sir John Gielgud, below. He makes Lewis Carroll sound like Shakespeare! The celebrated dry wit that served him so well throughout his illustrious career keeps this 1989 Alice very easy on the ears. He takes the opposite approach from Plummer, underplaying the character voices. It’s rare to find a gentleman of 85 who can play a 7-year-old girl so convincingly, and with so little fuss. To listen to Gielgud on Spotify, you will of course need Spotify’s software and account, both easy to come by: you just download and register. 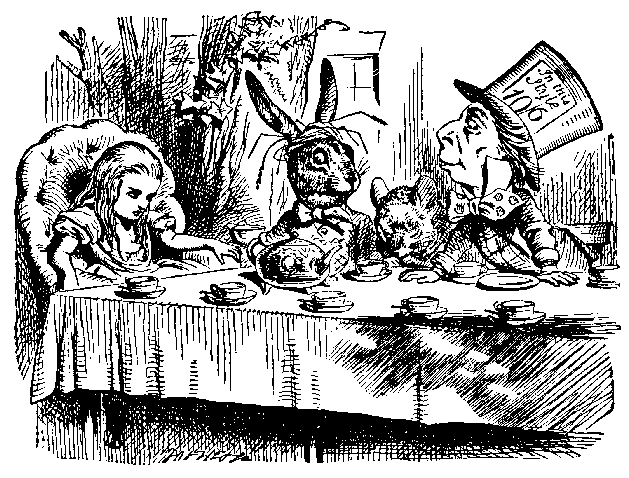 Other readings of Alice can be found in our collection, 1,000 Free Audio Books: Download Great Books for Free. if i don’t use spotify, is there a place i can download .mp3 file(s) to my pc so i can transfer the book to my mp3 player? Why is this not available on south africa?